The purpose of this article is to address the question as to why rifting occurs, why some continents will suture together, and stay together, while others rift apart. The ideal modern day example of this is the East African Rift System. Plate perspective views of this system can be found via the buttons on the right. The entire system is interpreted to be a reactivation of orogenic structures developed during the East African Orogen; the suturing of Australia, India, Madagascar, South America, and Africa to make Gondwana (Corti, 2009). Yet each of these continental plates are actually composed of smaller continents called 'Cratons' which are themselves sutured together. Why does some suturing last, while others break apart? 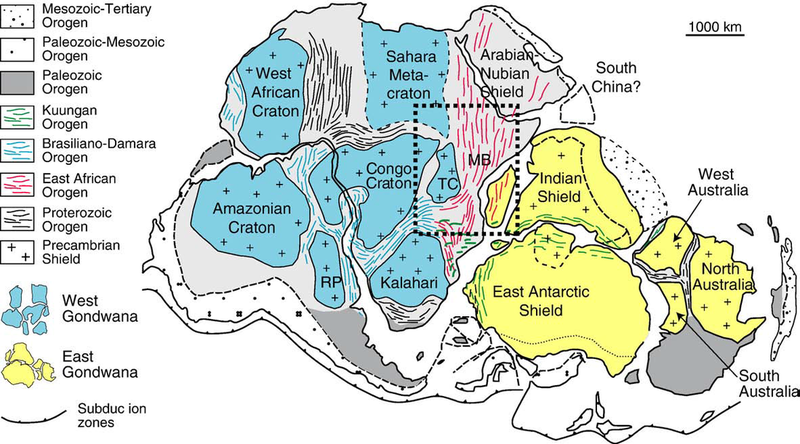 To compound the question further; the Sao Francisco Craton (found in South America) used to be part of the Congo Craton (now in Africa) and was broken apart during the rifting of super continent Rodinia (Waele, Johnson, and Pisarevsky, 2009). How does the rifting process choose between cutting through a craton or an existing suture? Why is continental/thick Crust more susceptible to rifting than oceanic/thin crust? Why are suture zones more prone to rifting (at least in the modern day)? What's so special about Archean continents/cratons? 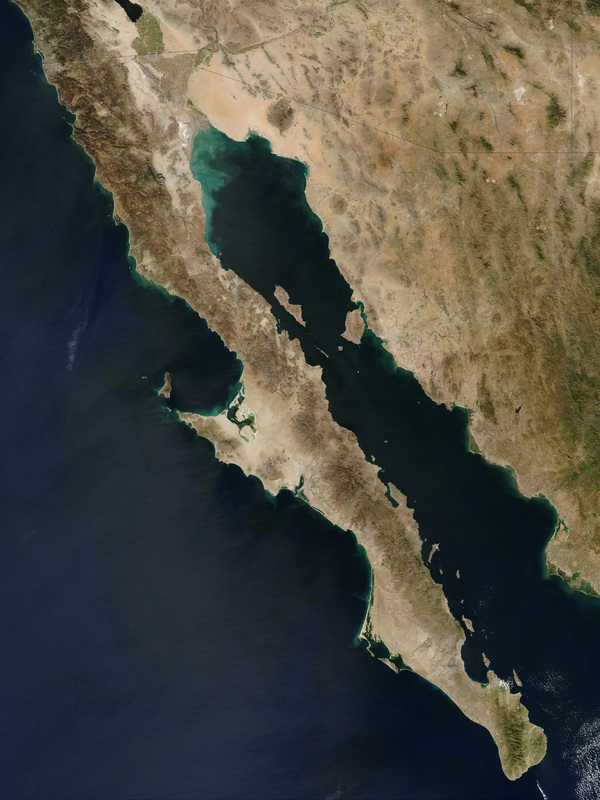 Why is Continental Crust more susceptible to Rifting than Oceanic Crust? Vink et al. 1984 attempted to answer this question by making two rheologic simplifications when dealing with the two forms of crust on Earth; Continental crust can be thought of as quartz dominated, riding on an olivine-dominated basement. The oceanic crust lacks the effects of quartz. This gave rise to the structure seen to the right; a profile of anisotropic tensional stress by depth. 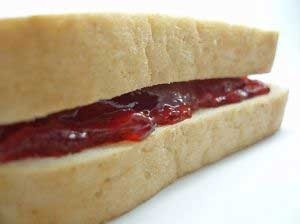 Image: The Jelly Sandwich model. The top layer is the quartz brittle layer. The middle layer is where quartz begins to plastically deform; this layer is the critical weak layer of continental crust. The bottom layer is an olivine dominated brittle layer. The entire sandwich is 35 + km thick. Image: Difference between horizontal and vertical tensional stress plotted by depth. Lambda represents pore pressures. Oceanic crust's strength boundary is plotted in blue (note; the oceanic crust is not 35 km thick). Continental crust's strength boundary is plotted in red. The weak layer between 13 and 30 km is the "Jelly" in the "Jelly Sandwich" strength model. (Vink et al. 1984) Colors are overlain by the author of this article. Image: Gondwana and its contained cratons. The Congo Craton can be seen in the middle of Africa with a limb that extends into South America. This limb becomes the Sao Francisco Craton. The Brasiliano-Damara Orogen is represented as blue irregular lines. Why are suture zones prone to rifting in the modern day? 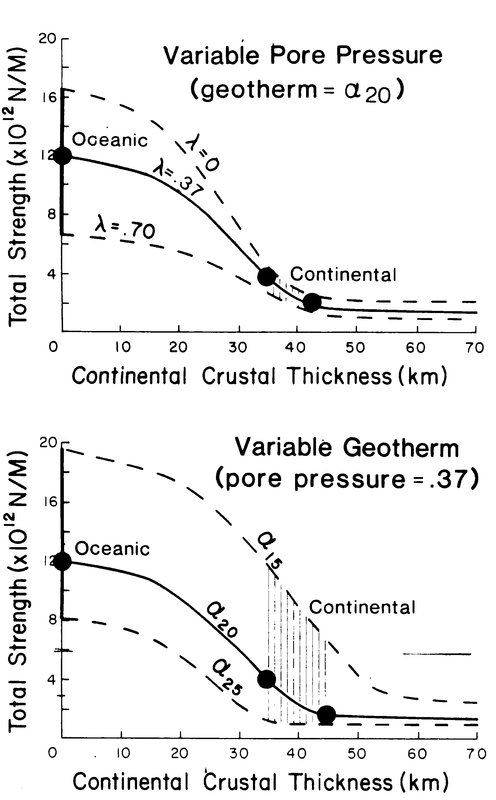 As mentioned in the section above, continental crust is more susceptible to tensional stresses than oceanic crust, and the issue is only compounded with thicker crust like in orogenies (Vink et al. 1984). This however is not the only factor that affects a continent's ability to tear. Another critical aspect controlling rifting and rift propagation is the amount of damage the crust involved has already accumulated, and how fast the crust is healing. (Lyakhovsky et al. 2012). This notion of inherited damage may be the solution to the 'tectonic force paradox'; the seeming tensional-stress deficit to tear apart thick lithosphere without plutonic assistance (Karner, et al. 2004), (Lyakhovsky et al. 2012). The results of the modeling done by Lyakhovsky et al. (2012) show that rifting is the result of earthquake induced brittle damage effectively winning out over elastic recovery of microcracks; the latter driven by high pressures, high temperatures, and low shear -without the need of magmatic activity. This sort of process is used to explain the Red Sea, and the rifting of the Arabian and Nubian Plates (Lyakhovsky et al. 2012). Inherited damage, found in great abundance within orogenic belts are then reactivated during rifting, like in the East African Rift (Corti, 2009). 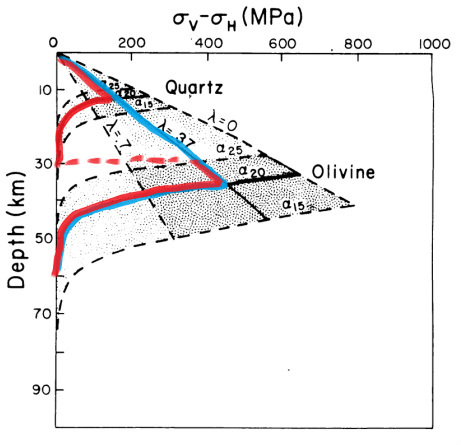 It is important to note that other theories exist to aid in rifting specifically in the olivine-dominated lower lithosphere; water weakening, diffusion to dislocation creep within olivine, and change in grain size (Lyakhovsky et al. 2012). Why are Archean sutures more resilient than more recent ones? This question is really about continent formation. The African Arabian system is notable in this regard due to the Kaapval Craton. The Kaapval Craton is the oldest craton known, having formed as early as 3.7 bya (Corti, 2009), (Karner et al., 1992). 3.7-3.2 bya, during the period of amalgamation, intra-crustal melting produced an upper layer of granite converting what was previously several sutured greenstone belts into a 'true' continental platform with a significant thickness of 40 km, and a lithospheric root between 170 and 350 km in depth (Karner et al., 1992). This corresponded with a time when crustal growth rate was 3-4 times the average rate of the Phanerozoic due to a hotter earth (Karner et al. 1992). Crustal healing rates, being partly dependent on temperatures (Lyakhovsky et al. 2012), would thus be heightened during the Archean. 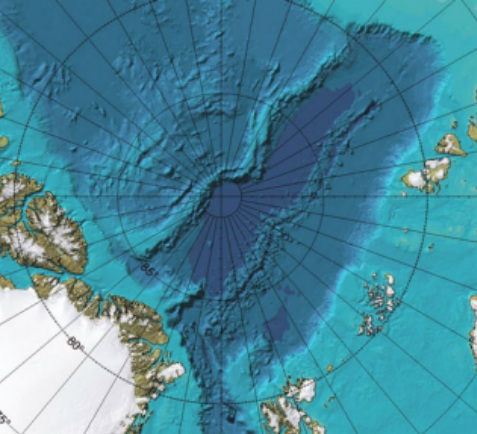 Given that every craton is smaller than the continent it is within, one is lead to question whether wider continents are less stable than smaller ones. This notion has been used to explain why super continents like Pangaea rifted apart; the mechanism being the continent itself insulating the mantle, eventually heating it up. However modeling done by Philip J. Heron and Julian P. Lowman (2011) indicate that temperatures below a super continent do not increase significantly over the timescale that supercontinents typically exist. Image: Location of Cratons worldwide. The Kaapval craton is located in the far-South of Africa. Why do continents like Africa behave so cohesively despite being only an amalgamation of smaller parts? 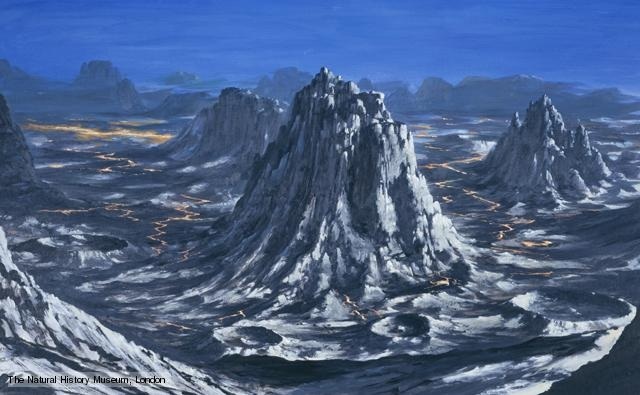 Image: Artist's impression of what the Archean may have looked like. Image taken from the Natural History Museum, London, England. Image: Geo-modelers returning the insulation theory back to geologists. The author of this article was quite fond of the insulation theory. The intense heat, magmatic activity, and continental growth during the Archean likely resulted in collided cratons whose boundaries healed and were fused together more quickly than what is observed in modern day (Karner et al. 1992), (Lyakhovsky et al. 2012). Today, suture/orogenic zones are preferentially chosen for by tensional forces as sites of rifting due to thickened (intrinsically weaker) continental crust and inherited damage from the original orogeny (Vink et al. 1992), (Lyakhovsky et al. 2012). Although the depth of a continent is an important factor for instability (Vink et al. 1992), greater surface area and associated insulation of the mantle is not significant to the instability of a continent(Heron and Lowman, 2011). B. De Waele, S.P. Johnson, S.A. Pisarevsky. 2008. Palaeoproterozoic to Neoproterozoic growth and evolution of the eastern Congo Craton: It’s role in the Rodinia Puzzle. [Crawley, Australia. Yokosuko, Japan]. Precambrian Research. Volume 160, Issues 1-2. 127-141. D. R. Gray, D. A. Foster, J.G. Meert, B.D. Goscombe, R. Armstrong, R. A. J. Trouw, and C. W. Passchier. 2007. A Damara Orogen perspective on the assembly of southwestern Gondwana. [Gainesville, USA. Adelaide and Canberra, Australia. Rio de Janeiro, Brazil. Mainz, Germany]. Geological Society of London Special Publications. Pages 1-43. Garry D. Karner, Brian Taylor, Neal W. Driscoll, and David L. Kohlstedt. 2004. Rheology and Deformation of the Lithosphere at Continental Margins. [New York, USA]. Columbia University Press. Pages 3-8. Giacomo Corti. 2009. Continental rift evolution: From rift initiation to incipient break-up in the Main Ethiopian Rift, East Africa. [Firenze, Italy]. Elsevier Earth-Science Reviews.Volume 96, Issues 1-2, 1-53. Gregory E. Vink, W. Jason Morgan, and Whu-Ling Zhao. 1984. Preferential rifting of continents: A source of displaced terranes. [Princeton, New Jersey]. 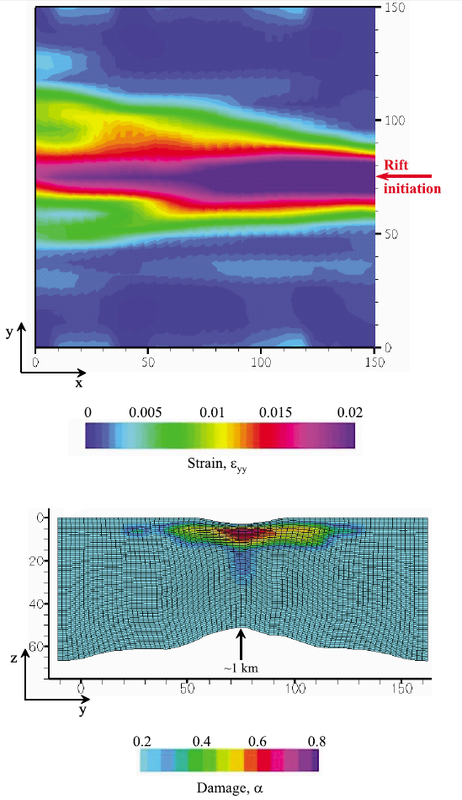 Journal of Geophysical Research: Solid Earth. Volume 89, Issue B12, Pages 10072-10076. Maarten J. de Wit, Chris Roering, Rodger J. Hart, Richard A. Armstrong, Cornel E. J. de Ronde, Rod W. E. Green, Marian Tredoux, Ellie Peberdy and Roger A. Hart. 1992. Formation of an Archean continent. Nature. Volume 357, Issue 6379, Pages 553-562. Phillip J. Heron, and Julian P. Lowman. 2011. The effects of supercontinent size and thermal insulation on the formation of mantle plumes. [Toronto, Canada]. Tectonophysics. Volume 510. Issues 1-2. Pages 28-38. V. Lyakhovsky, A. Segev, U. Schattner, and R. Weinberger. 2012. Deformation and seismicity associated with continental rift zones propagating toward continental margins. [Jerusalem, Israel. Haifa, Israel]. Geochemistry, Geophysics, Geosystems. Volume 13, Issue 1, Pages 1-21.